Is your family a pizza loving group? Do you like to try new toppings and ingredient combinations? Do you get sick of eating the same old pizza all the time (for my kids it’s cheese and pepperoni EVERY time). If you answered yes to any of these questions you need to head to Newport and grab a pizza pie at Strong’s Brick Oven Pizzeria. Strong’s Brick Oven Pizzeria uses an Italian brick oven to make delicious pizzas as well as breads, appetizers and desserts. They also offer some scrumptious salads. You can create your own pizza with choices of toppings and sauces. 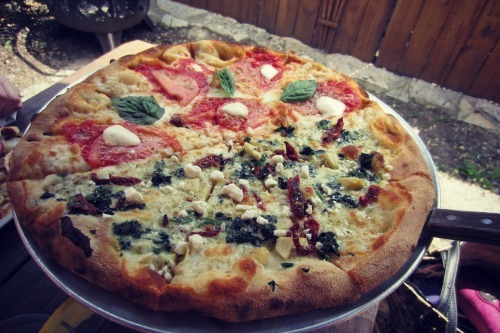 OR you can choose one of their gourmet specialty pizzas…they have something for everyone! And as an added bonus you can get a half & half pizza if you want to try two different kinds. 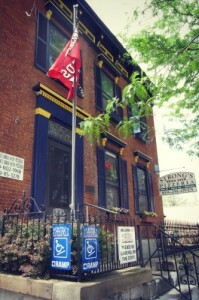 You can dine inside at Strong’s or on their patio, which is what we did. It’s very relaxed and casual at Strong’s, you almost feel like you’re eating pizza at someone’s house because the staff makes you feel right at home. And the prices are reasonable too! So it has all the qualities of a must-try pizzeria. Make plans to get to Strong’s soon, your family will thank us. This amazing concoction is the Strong’s Signature Salad ~ big enough for two adults to share (with a few bites shared with the munchkins). 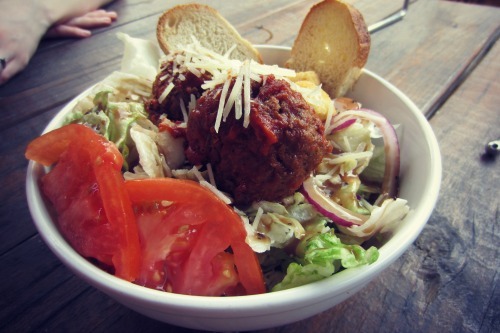 Why yes, that IS a meatball on my salad. It was SO SO SO good! While our boys dined on plain cheese, the mamas had a half and half pizza. One half was a Margherita and the other was Mediterranean. This is a great option for people who can never make up their minds about what to eat! I loved trying two different pizza pies. 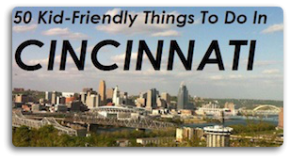 Strong’s Brick Oven Pizzeria is located at: 336 Monmouth St, Newport, KY 41071 They offer dine in, carry out, delivery AND they have a Brick Oven Trailer that they can bring to your party or event!